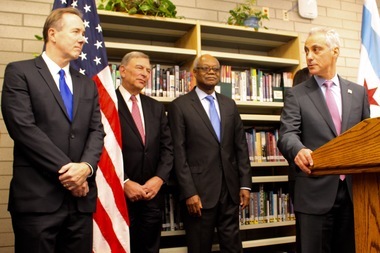 Mayor Rahm Emanuel (r.) is pushing along a proposed $45 million tax levy sought by CPS CEO Forrest Claypool (l.), former Board of Education President David Vitale and current board President Frank Clark. CITY HALL — Aldermen already skittish about a likely $500 million hike in property taxes now have to sign off on a $45 million additional tax levy that Chicago Public Schools wants to modernize buildings. The Emanuel administration announced late Sunday that a $45 million tax levy already approved by the Board of Education would go before the City Council for final approval. "It's no secret that some Chicago Public Schools buildings have fallen victim to years of delayed investments, sweltering classrooms and severe overcrowding that have children learning while sitting in stairwells, hallways and even in converted closets," said Lauren Huffman, spokeswoman for Mayor Rahm Emanuel. 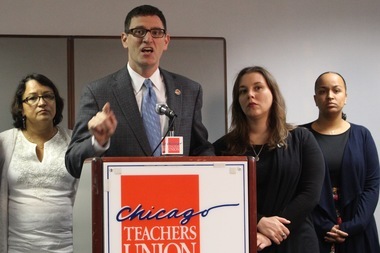 "This is a tax levy that should have been done a long time ago," said CTU Vice President Jesse Sharkey. So CPS is seeking what's being called "a special School Modernization Property Tax Levy" to address capital repairs and improvements and to speed the installation of air conditioning in all classrooms. Such tax levies were authorized by the General Assembly in 2003 but require local government approval. Yet the Chicago Teachers Union said it was long overdue — and almost certainly insufficient to hold off a financial "crisis" that could lead to a strike. "This is a tax levy that should have been done a long time ago," union Vice President Jesse Sharkey said Monday at the Merchandise Mart. He pointed to how CPS had built numerous schools over the last two decades, including new selective-enrollment high schools like Northside and Payton, borrowing all the way and paying off the loans by using operating funds. "In short, we face a looming crisis," Sharkey said. While recognizing that, aldermen seemed more receptive to the levy. "I certainly want to see the details tied to the levy," Ald. Brendan Reilly (42nd) said Monday. "I think aldermen are under a lot of pressure right now from their constituents. Every little bit hurts. "But no one could argue CPS is not in dire financial straits," he added, citing news reports over the weekend that the school system could face 5,000 layoffs if the General Assembly does not fill a $480 million hole in its budget. "That's one of those wounds that needs to be cauterized," Reilly said. The Board of Education has already approved a $19 million tax increase for next year, the highest allowed by laws limiting hikes to the rate of inflation. Sharkey too mentioned CPS Chief Executive Officer Forrest Claypool's threat to issue "5,000 pink slips as early as Thanksgiving," and warned it could lead to a strike in the new year, saying, "We will react to that in the strongest way we can." According to Sharkey, the loss of 5,000 teachers would mean as many as 150,000 students would lose their teacher. "Virtually every student will experience chaos," he added, as schools scramble at midyear to reconfigure classes and alter lesson plans. Sharkey said, "The educational experience of our students would be greatly diminished." Sharkey also said the threatened layoffs had thrown a wrench in ongoing negotiations for a new contract. "It's really hard to settle a contract when there's this much uncertainty," he said. "We're struck far apart on a whole bunch of issues." The mayor presents his 2016 budget proposal to the council on Tuesday, with expectations that it will include a $500 million increase in property taxes.